In April 2006 we are traveling to the Indo-pacific islands of Palau for a 2 week sea kayaking expedition through the spectacular rock islands. Palau has been described as, “the underwater Serengeti of our planet”, and its superabundance and diversity of reef fish and coral life is simply without parallel anywhere else on earth. We became interested in the trip after meeting the trip leader, Ron Leidich, during our 2005 trip to the Galapagos. Originally we’d been targeting a safari to the Serengeti in Africa, but after a week of Ron’s colorful descriptions, finding out what a great guide he was, and realizing that the trip was a prefect fit to all of our previous experience of combining sea kayaking and snorkeling for reef exploration, we decided to postpone Africa and head for the Pacific. The following is our working documentation and chronicles for the trip. 1/28/2006 - This past week was spent wiring up air travel arrangements. We've found that travel to and from a destination is always the most complex part of the trip. This time it was no different. We'd held off on booking air until we were sure that the WT trip had enough people booked to go. We know we were gambling that the air fares would stay down and that flights wouldn't book. However if we booked the air and then the actual trip didn't go we'd be stuck with tickets. Right after the holidays we got word from WT that the trip had two more sign up and was a definite go. We decided to go ahead with the airline booking. We'd heard that WT did a good job of air booking so we requested that they go ahead and book a travel itinerary. They did so and sent us the itinerary via email. We found that the itinerary was the exact same we'd looked at with Continental, same flights, times, everything -- but the cost was over $600 dollars less! As we understood the email, we had 7 days to accept the itinerary at the price listed. We were about to get a big lesson in "reading the small print". 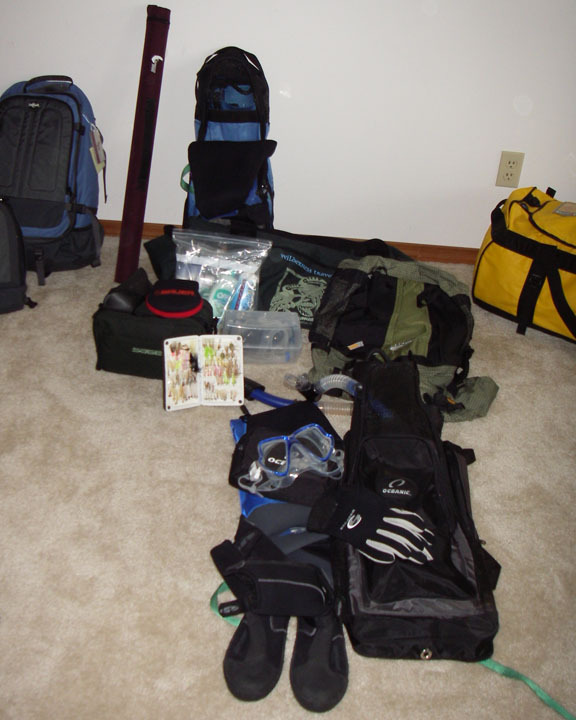 3/12/2006 - Let the packing begin! As we approached the 6 week mark we decided it was time to start all the prelim packing. We found over the years that the sooner you do this the sooner you can get everything into a pile and then toss out half of the items you really won’t need. 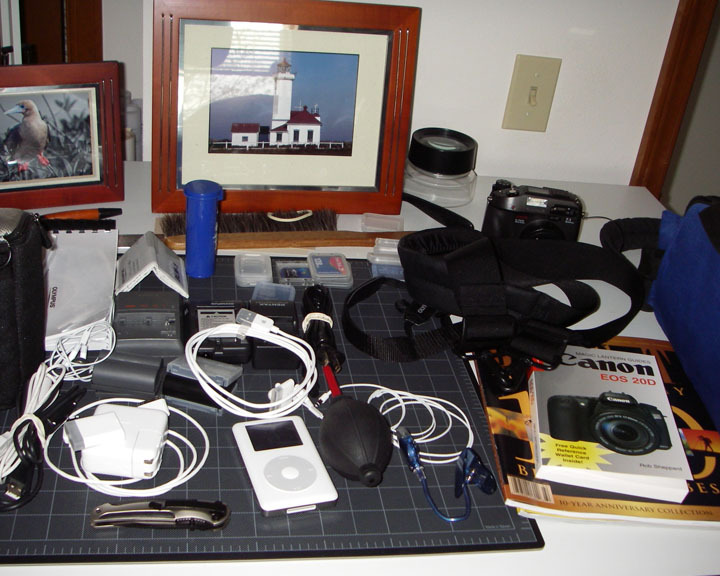 If you pack right before the trip you wind up taking all the stuff in the original pile. 3/19/2006 - Let more packing begin! So after pulling up the old Belize gear list, we pulled out everything and did a prelim pack. The good news is the pile is pretty small. The bad news is its heavy. 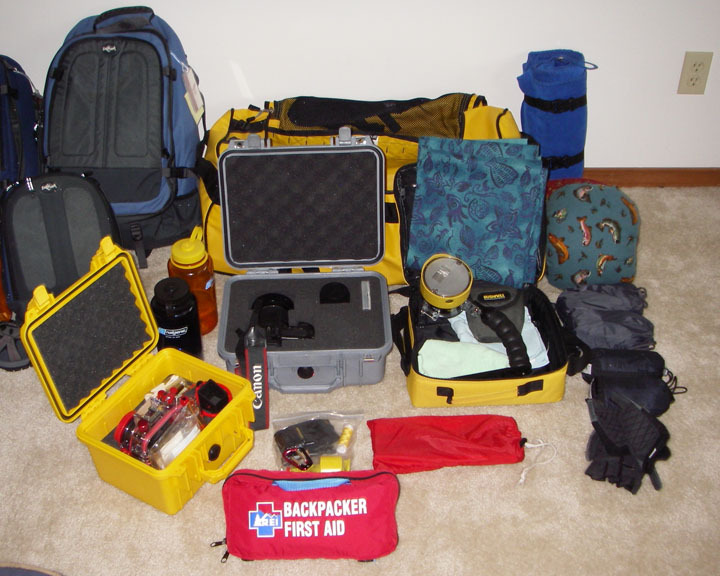 We were able to get everything into a single North Face duffel (even the camera Pelican cases) but have tipped the airline scales. We learned our lesson last year in Ecuador - stay under the weight limit! Otherwise you'll be dumping ballast at the airport. 4/10/2006 – We’re on final count down and less than a week from departure. Scary and exciting at the same time… “All our bags are packed, we’re ready to go”. Now if I can just remember all those functions on the C7070 underwater camera system. 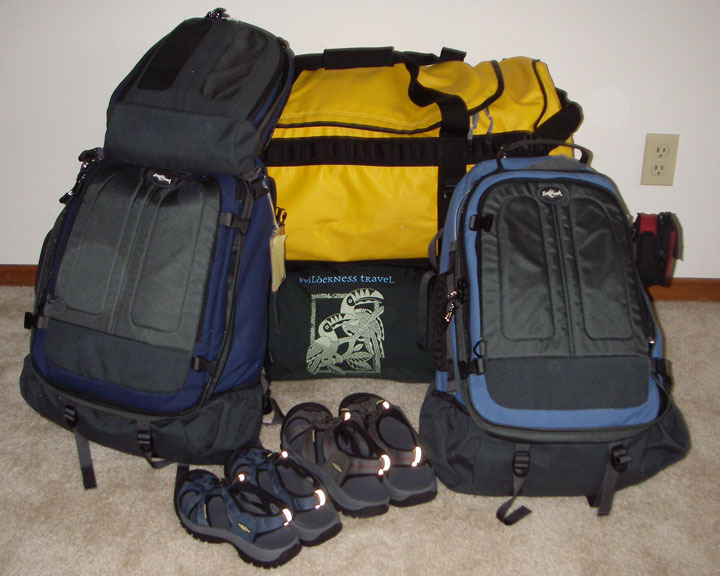 5/1/2006 – We’re back, unpacked, drying out, and sleeping off the jet lag. Notes, photos, etc. are in work. We came back with over 1,100 frames, of both underwater and terrestrial shots, and Ron has shared his originals with us as well! Keep an eye in the Palau photo album for updates.